Your friend Stanley has recently completed college and has just started a new job. Stanley has $40,000 in student loans to pay off at an interest rate of 7%. Stanley’s starting salary at his new job is $50,000 per year. Additionally, his employer offers a 401(k) match of 2% of salary. Stanley understands the importance of saving for retirement and would like to save as much as possible toward his future. Stanley also understands that he is $40,000 in debt and he would like to pay off his student loans as quickly as possible. He isn’t certain how he should prioritize his budget though, and he’s heard a lot of conflicting advice. When he asks you, what would you recommend: Should he focus on paying off his student debt before investing for his retirement? Or should he save as much as he can toward retirement before paying off his student loan debt? What is the probably the best way to prioritize investing versus paying off student loan debt? Stanley should contribute 2% of his salary to his 401(k) to get the employer match. After this priority is fulfilled he should put as much money as possible to paying off his student loans. Stanley should focus on paying off his student loans first. Only after all loans have been paid off, should he start saving towards retirement. He should not contribute to his 401(k) until his student loans are paid off. Stanley should save as much money as he can in a taxable individual account. Stanley should use the investment returns from this account to pay off his student loans. Generally speaking, it makes the most sense to only contribute to retirement accounts after you are free and clear of debt obligations. One exception is when the employer offers a matching contribution to a 401(k) account. While not recommended, even if you were to withdraw the matching contribution (and pay a penalty in most circumstances) you’re still receiving compensation that you otherwise wouldn’t have received. In this particular scenario, it probably makes sense for Stanley to contribute 2% of his salary to the 401(k) to get the employer match since an employer match is essentially additional compensation. Even if Stanley were to immediately withdraw the employer match (and pay a 10% early withdrawal penalty) he’d still have $900 more in salary ($50,000 x 2% x 90% = $900) that he otherwise wouldn’t have. If Stanley was able to generate a return in an investment account above the 7% interest rate on his student loan, then it would make sense to fund an investment account and use the returns to pay off student loans. It is not realistic to expect a rate of return of 7% per year on any investment. It is definitely not realistic to expect a rate of return above 7% on a money market fund given the current interest rate environment. 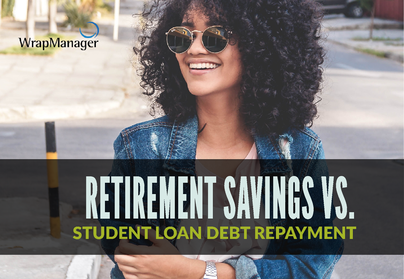 Generally speaking, a person in a position to pay off debt and make the maximum contribution to their retirement account should do both. Stanley doesn’t seem to be in a position to pay off all of his debt and max out his retirement contribution this year so he needs to set priorities in his budget. Since he has an employer match on his 401(k), he should first contribute 2% of his salary to get the employer match. Next, he should prioritize paying off student loans. Once his student loans are paid off and Stanley is free of debt, he should contribute as much as possible to his retirement account.